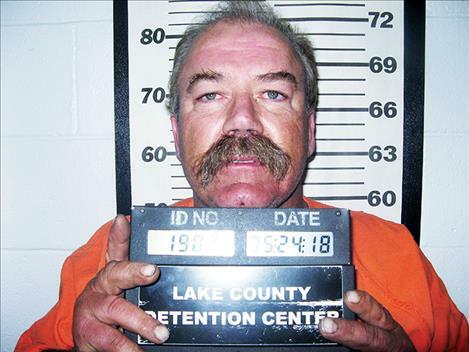 A former school bus driver and owner of a bus company who was caught in possession of methamphetamine had his sentence deferred for three years in accordance with a plea agreement on March 14 by District Judge Deborah “Kim” Christopher. Scott William Johnson, 55, pled guilty to a single count of felony criminal possession of dangerous drugs during a change of plea hearing on Sept. 27. Additional felony counts of endangering the welfare of children and criminal distribution of dangerous drugs were dismissed as part of the plea agreement, which was initially rejected by Christopher after she received numerous complaints by concerned citizens through social media postings and calls to the Lake County Clerk of District Court’s office. Experts testified during an evidentiary hearing in February that the state could not prove the facts supporting endangerment and distribution charges. Around May 25, 2018, Lake County Sheriff’s Office deputies were equipped with a warrant following a months-long investigation, according to court records. The deputies had witnessed a drug deal involving Johnson and made a traffic stop on his vehicle shortly after the deal. Johnson told the deputy he was a bus driver for the St. Ignatius School District and he must have him confused with someone else. Johnson later confessed to having purchased and smoked methamphetamine and that he could “buy methamphetamine easily.” A search of the vehicle Johnson was stopped in produced the 3.5 grams of meth he had purchased. Deputies involved in the investigation interviewed an unidentified “citizens’ informant” who indicated they had purchased methamphetamine from Johnson a week prior to his arrest in exchange for cash and sexual services. The informant also stated they smoked meth in the bus barn and in the school’s blue and white “sports bus” and other buses. During a change of plea hearing in September, Lake County Chief Deputy Attorney James Lapotka explained to Christopher that the distribution charge was based on circumstantial evidence that could be difficult to prove at trial. Johnson’s attorney, Britt Cotter, told the judge that there was no definitive proof that meth was ever used on the bus. Although two buses and the bus barn initially tested positive for methamphetamine, Lapotka explained that more extensive testing showed the levels of meth that were detected did not pose a health risk. As for the alleged trading of sexual services for methamphetamine, Lapotka explained there was no force involved and that if that did occur it was between consenting adults. Johnson presented the court with a check in the amount of $11,765 to pay for any cleanup costs incurred by the St. Ignatius School District. Johnson also presented proof that he voluntarily and successfully completed a 28-day drug treatment program satisfying a concern of the court.